Developed by John Lees to supplement the exercises printed in How To Get A Job You Love, this card sort is now in its 4th edition. Used widely by career transitioners, job hunters, and career coaches, the JLA Skill Cards help you discover and understand your motivated skills and communicate them to employers. 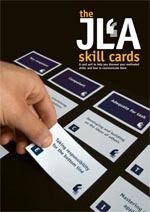 The JLA Skill Card toolkit is designed to familiarise you with your motivated skills – in other words, skills where you operate effectively and gain task satisfaction. Detailed instructions are provided in a downloadable document, enabling you identify learning objectives, see skill gaps, and communicate your career highlights and achievements. The cards and associated exercise have been revised and improved several times , and are used by career coaches and career changers all over the world. The exercises contained in the explanatory booklet are designed to be used by coaches, trainers or by individuals who want to gain more awareness of their skills, which are broken down into five categories: People skills, Information Skills, Skills using Things (equipment, physical skills), Enterprise skills (leading organisations, initiating and leading projects) and skills around Concepts and Ideas. The Skill Cards cost £23.00 per set (inc VAT & UK postage – see drop-down menu for delivery prices overseas). Please note we are at present offering a reduced rate delivery to Australia and New Zealand. Click on the above link to order one or more sets, using credit card or Paypal, or email us for discounts on orders of 10+ sets. I love these cards. They are extremely useful and come with exercises to guide their use. The cards help you to dig deeper into your career motivations and your own skill set with easy step by step exercises that can be surprisingly revealing. I have used them a few times over the years to check in with myself and my career goals. This is a little bit of John Lees' wonderful career guidance in a handy box, and that is something pretty special.